Tips for a Safe and Enjoyable Pedicure In this video, Dr. Arya discusses how to have a safe and happy pedicure! An Ingrown Toenail, also known as an IGT, is a serious problem. Some people have a genetic predisposition to get IGTs, others might find them after wearing particularly narrow or tight fitting shoes. The classic case is a child who is growing, not realizing they are in the wrong size shoes. Patients often want to perform bathroom surgery at home, and this only makes the ingrown nail and infection around it worse. Here is a picture of an ingrown nail on both the inside and outside corners of the nail. 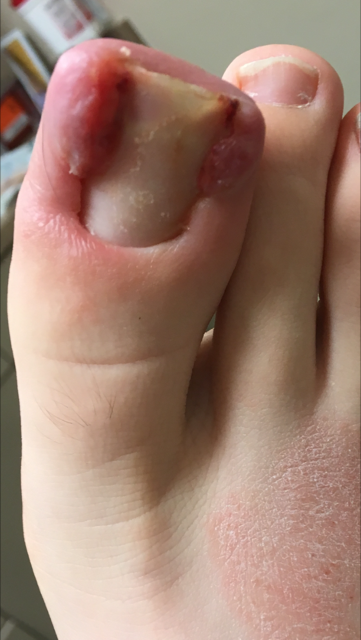 This patient ultimately was put on antibiotics and had surgery to remove the entire nail, because the nail had gotten very severely infected and ingrown. Don't mess around with IGTs, come straight into the office so we can clean up the infected border. If this patient had come in sooner, we could have just removed the sides that were digging into the skin. Save your toes the pain, swelling, drainage associated with ingrown toenails...please come into the office for an evaluation before things get bad. We are here to help keep your feet happy and healthy. See you soon!